PLEASE NOTE : WHEN SOLD OUT THESE TREE SOAP MOLDS WILL BE GONE FOREVER -- The Original Designer & Creator of Our Soap & Candy Molds (who, BTW is a long-time family friend), is no longer producing these ... When Sold Out, they're Gone! This mold is not designed to be used for food items! 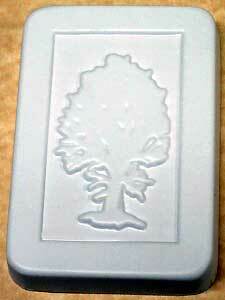 Please see our Tree of Life Candy Mold instead. FOR U.S. CUSTOMERS ONLY -- Soap Molds are bagged in clear poly bag with header card. Average size of mold sheets are 8-3/4" x 8-3/4" with a totally flat back for clean scrapping of soap to the edge after filling. This facilitates easy clean up and less waste. Designed for both the professional and home hobby soap maker.